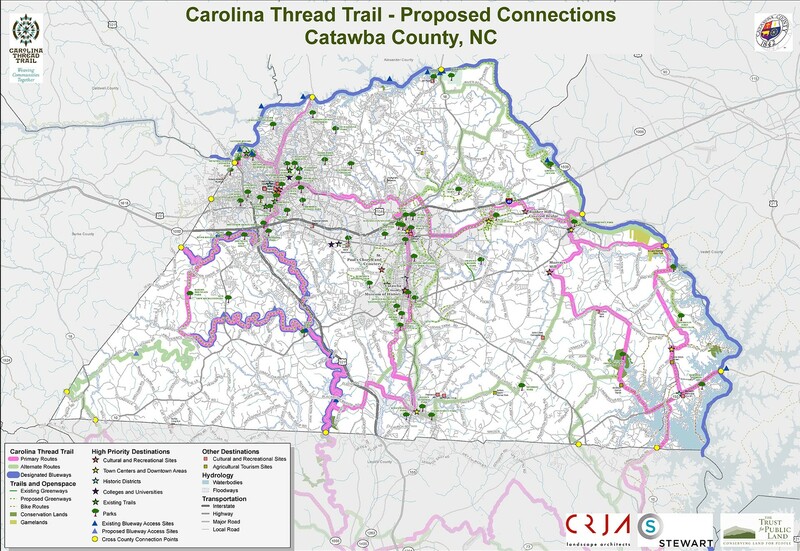 CRJA-IBI Group worked with Catawba County, NC to master plan and implement that County’s segment of the Carolina Thread Trail—a regional trail network connecting 15 counties in the Carolinas and part of the county-wide Greenway Master Plan. Working with planners, engineers, and Trust for Public Land (TPL) staff, along with input from stakeholders, citizens, other public agencies and adjacent counties, CRJA-IBI Group prepared a master plan that identifies conceptual routes and the border trail network to which the Thread connects; developing an action plan including segments ready for implementation; and producing a publicly adoptable county-wide Greenway Master Plan. All work incorporated the Thread Trail’s Guiding Principles of connectivity and collaboration among municipalities and counties; inclusiveness for all users and types of communities, leveraging to stimulate public and other private investment; and respect for the land and landowner.